As Internet Service Providers (ISPs) increasingly impose monthly data caps to consumer accounts, users who stream video, play online games, or just use the Internet a lot, find themselves at risk of incurring unexpected fees. You can avoid these fees by keeping track of how much data you use. 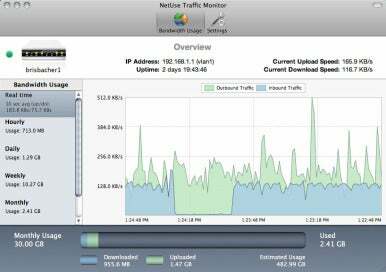 NetUse Traffic Monitor (Mac App Store link) keeps an eye on your Internet activity, displays it on a graph, and provides alerts to keep you out of the bandwidth poorhouse. When you launch NetUse Traffic Monitor for the first time, the app tries to locate and connect to an SNMP-compatible router. If there’s a problem with SNMP access, you may face some troubleshooting here. The online and in-app help offered could use improvement—do you know your router’s gateway address, or the SNMP community-string password NetUse Traffic Manager needs to get started? A thorough walkthrough of problems and solutions would be a big help for network configuration novices. Once NetUse Traffic Monitor has found your router, it will begin tracking upload and download traffic between your network and the Internet. (You can set it to exclude uploads if you wish.) The usage graph displays traffic in real-time—hourly, daily, weekly, monthly, and annually. Keep it running at all times to maintain a complete record. Below the graph, a segmented bar shows upload and download traffic, and estimates monthly data transfer based on past usage. If you know that your Internet account comes with a 10GB per month bandwidth cap, and that your billing period begins mid-month, configure NetUse Traffic Manager to alert you when you’ve reached a certain percentage of the total. If your home or business account comes with a bandwidth limit, NetUse Traffic Monitor makes it easy to keep track. The hardest part about using the app is getting it set up: troubleshooting SNMP could be frustrating for some users.